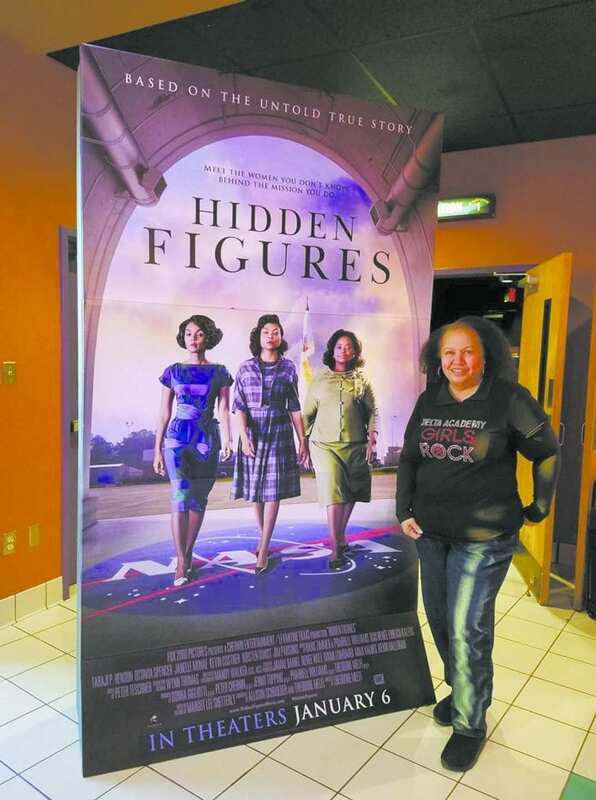 Helen Westbrook stands next to the movie poster for “Hidden Figures.” Her Aunt Katherine Goble, who was one of the African American women doing calculations for the space program in the 1960s, was portrayed by Taraji Henson (middle in poster). Nashville resident Helen Westbrook’s entire family takes pride in the inspiring story of her Aunt Katherine currently being told on the big screen. 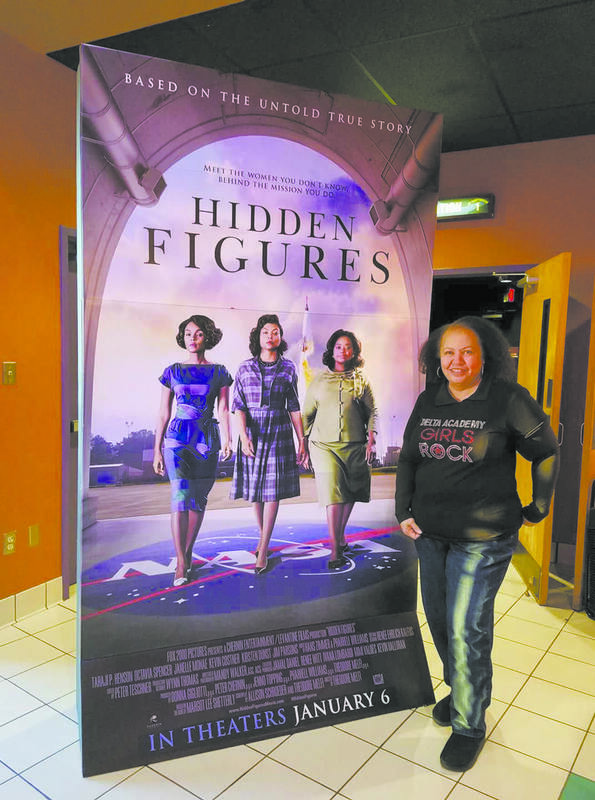 “Hidden Figures,” has been the number one box office hit bringing in millions of viewers to see the story of the African American women who were an integral part of the space industry in Virginia during the 1950s and 1960s. They worked behind the scenes at the National Aeronautics and Space Administration (NASA) making the critical calculations needed to launch rockets. She said her cousins were able to attend the red carpet premiere in New York. “They put pictures on family website and cousins in different parts of country have hosted showings,” Westbrook said. Westbrook’s Aunt Katherine was already working at NASA when she was born. The story of her Aunt Katherine and her close friends working at NASA was first featured in a book by the same title as the movie. When the movie opens, her Aunt Katherine’s first husband, whose last name was Goble, had already passed away. Goble is Westbrook’s maiden name. Her aunt was married to her father’s brother. Her widowed aunt was trying to raise three daughters on a teacher’s salary. She was able to get the job at NASA where she earned more money but still less than the men doing the same job. These African American women were crucial to the early successes of the country’s space program. They worked in segregated offices, “often on clunky machines,” manually performing the calculations needed, Westbrook said. Their story has been hidden from mainstream society – until now. As NASA approached its 50th anniversary, the story of the mathematical calculations done by African American women in segregated offices started to emerge. First the book, then in 2015 the Presidential Medal of Freedom and last year, the movie, Westbrook said. NASA named a building after her, too, she said. Westbrook got to know her aunt through family gatherings, traveling from their home in St. Louis, MO to Virginia at least once a year to visit their grandmother on her father’s side of the family. “It was just a very normal family,” she said. Aunt Katherine was always there,” she said. Getting your education was always emphasized at family gatherings. “It was the golden key,” Westbrook said. “It was always emphasized. At the time when my father was growing up to be able to go to college, it was an achievement.” And the family passed that on to Westbrook’s generation. Westbrook said she knew her aunt worked at NASA, the space program. “It was a big deal,” she said but she didn’t fully understand the importance of it until later. And it really did happen that astronaut John Glenn called for her as shown in the movie, Westbrook said. He said “get the girl, get Katherine. They trusted her abilities,” Westbrook said. She added that the family was happy with the portrayal of her aunt in the movie. However, her aunt did feel the people she worked with were not as overtly racist as portrayed in the movie. That was a little dramatized for the movie. She felt they did recognize her abilities, Westbrook said. Westbrook, who is an engineer, said she could appreciate the work that her aunt did. “I took those heavy duty math classes too,” she said. She said was party influenced by her aunt to go into engineering. “Math came naturally to me as it did to her,” she said. Another good part of movie for Westbrook was seeing her aunt’s friendship with the other women shown. “At that time, they had to live in segregated housing. They lived in same vicinity. They were real friends. I never met them. They have passed away. They attended church together. And the family still attends the church that is shown in the movie,” she said. All three of the women were members of the Alpha Kappa Alpha sorority. It also thrilled Westbrook, a member of Nashville Alumnae chapter of Delta Sigma Theta sorority, when watching the movie to see her aunt typing her name on the reports to be submitted concerning the calculations for the launch. That was a very proud moment, she said.